Monday, Tuesday, and Wednesday January 28th, 29th, and 30th Bouncing Back! Madison woke up Monday morning with more energy than she's had in a week and Ingram was thrilled that her fever was gone so they could play all day long. They played WiiCar and WiiSki and made train tracks all over the house. And since it was 70 degrees and sunny outside in Memphis at the end of January, we moved our make-up work to the front porch to get some good Vitamin D! Ingram and Craig went to St. Jude Monday night to speak to a division of ALSAC and Ingram came home talking 90 to nothing about how much fun he had and what he ate and on and on and on! Tuesday Madison made it back to school for the first time in over a week and was exhausted when she got home. She was glad to be back, but definitely was glad to be able to lay down once she got home. Ingram and Lindsey had great days at school and were extra hyper when it came time for bed, unlike Madison who went to sleep as soon as she could! Wednesday we went to St. Jude to see friends the girls went to school. On top of seeing our favorite gal Mae, we were able to meet two other Ependymoma patients that we had talked to before but never met and it was so fun; not fun in a "ha ha" way, but fun in a "totally know what you're going through and so glad to finally meet you in person since we've been talking for almost 9 months" kind of fun. It's just like meeting other St. Jude patients but even more intense because we're the same tumor and a lot of our stories are very similar, but so different at the same time. 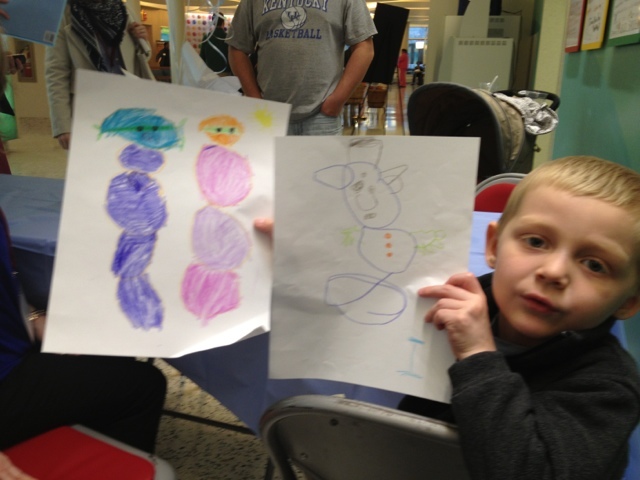 Ingram and tons of other patients were drawing picture and coloring pages at the Gymboree Art Party in hopes of turning their pictures into coloring pages for their stores. We also got to eat lunch with the Gymboree folks and share our story with them. Ingram was a stud as usual and was very well behaved; he told them his favorite part of St. Jude (getting poked and getting in the treasure box) and also told them about his girls and Beau. He was so funny though when he was talking to Beth (one of our favorite ALSAC gals) while we were eating; he was showing her pictures on my phone from our weekend at the farm and told her about every picture but only turned it just long enough for her to see the screen but not even the picture! He literally went through my whole camera roll, but I don't think Beth was able to see a single picture because of how fast he was going. The Gymboree folks were intrigued too so he started telling them about it too. We had a great time with them and are super excited about them being a part of the Thanks and Giving campaign; they're raised over six millions dollars since 2006 and they told us today that they're still coming up with new ideas to raise money to help St. Jude! 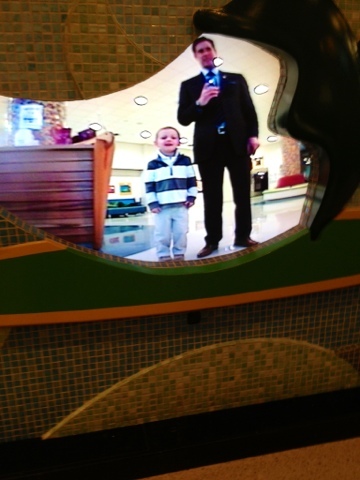 Ingram And Daddy Being Goofy In The Chili's Building! From Day One At St. Jude, Ingram Had Always Loved The Three "Peppers!" 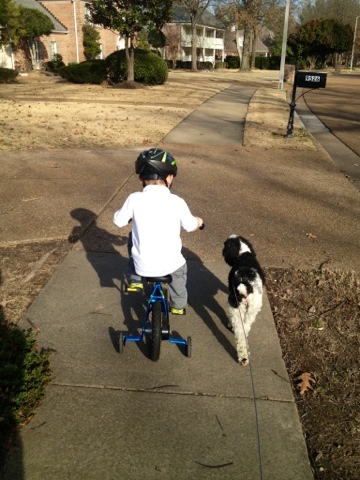 Ingram And Beau On Our Walk Tuesday In 70 Degree Weather...In January! 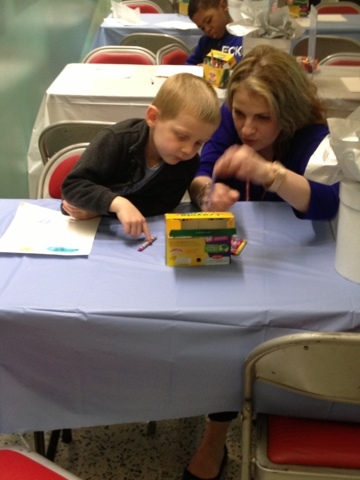 Ingram Picking Out The Perfect Crayon At The Gymboree Art Party!! 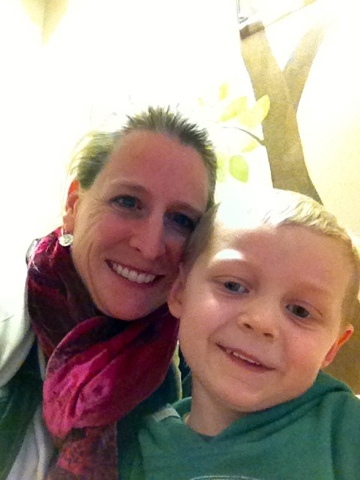 The Picture On The Left Is Ninja Turtles Ingram And Mommy! The Middle Picture Is Snowman Ingram! The Right Is Cutie Pie Ingram Recovering From A Black Eye (4-Wheeler) AND A Knot On His Forehead At His Hairline (Scooter)! A Sweet Friend Joked Today That He Needs A "Round The Clock" Helmet! 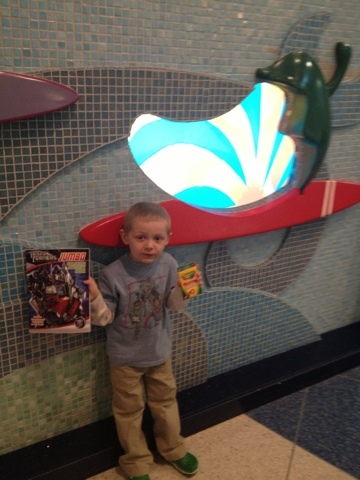 Thanks Mrs. Penny For The Coloring Book And Crayons! He Colored The Whole Way Home From SJ Today! Saturday and Sunday January 26th and 17th, Running From The Fever! We're still stuck with Madison's fever so now we're taking drastic measures...we're leaving town and hoping that the fever can't find us. 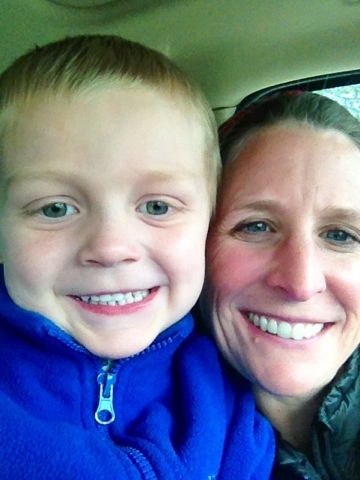 We packed up the car with Ingram's little 4-Wheeler and with our own 4-legged Beau and headed for the farm. We got there before dark and were able to unload the car and have some fun before bedtime. And if you know anything about being at the farm, there are no clocks so bedtime can be pretty late! We rode the 4-wheelers checking out as much of the land as we could before it was too dark. We put Beau in his crate while we rode at night just to make sure we didn't lose him; someone in this household would be very upset if we lost him! Also, at the farm is so much land and targets that we all just have to shoot a gun of some sort; I think it's part of the "Farm Handbook" that still has never been seen. I remember doing the same thingwith my sister when we were little and I guess some things never change. The only one that didn't shoot the gun this weekend was Lindsey, but she shot it Monday when she and Ingram were there with Craig. Sunday morning, Daddy took his girls out early in the morning to watch the deer come out from "Aunt Amye's Forts" as they have been named. Even though Uncle Len, Pops, Brett, and Carley all use the tree stands, Lindsey named all of them Aunt Amye's Forts and I'm sure the name will stick for years to come! The funny thing about the three of them going out to watch the deer was that they really would make the worst hunters in so many aspects. Madison pretty much summed it up when she said that they weren't going to see any deer this morning because they were doing pretty much all the "no no's" in hunting. Madison had on bright blue pants, Lindsey had on a bright pink coat, they were all talking and giggling, and they all smelled like people. But, they had so much fun and even managed to stay a little warm too. We shot the targets again and rode the 4-wheelers before the hunger really set in; we didn't have any food at the cabin so we headed into town for a late breakfast and ate at The Country Kitchen where it was obvious we weren't locals. Our kids don't have a "low" on their volume control and it was comical trying to explain to them over and over that we were in a small restaurant and they didn't need to talk for everyone to hear. Next we drove around the entire property on the 4-wheelers and ended up on a little spot in the land that we hope to build on one day. The kids really loved being at the farm and Beau definitley loved it too. During the daylight hours, he went everywhere we did and most of the time he was running right along the 4-wheelers with us. Only once did we need to pick him up so that he wouldn't get hurt going through some really thick brush. Now there were also times when he was running without being next to the 4-wheelers and we almost lost him a time or two. Luckily, my Suburban made it where other trucks couldn't and we were able to find him. He never was lost, but instead he was just chasing the trail of the 4-wheelers that left him behind or really chasing his Lindsey that had left him. Another time, Craig took Madison down the path to shoot the 22 and Beau followed them without them knowing; when they were coming back, they decided to see how fast Beau could run and they got up to 22 mph on the 4-wheelers and he was right there running beside them. Once we got back home, Beau didn't move much after his bath and slept in his bed for the rest of the night. So we had hoped to leave Madison's fever behind, but we're pretty sure it came with us to the farm unvited. We had so much fun in the fresh air that we didn't worry about it too much. Plus, we didn't take our thermomater with us so we wouldn't officially know if it was back or not and let Madison do as much as she wanted and she took it easy some too. She acted great the whole time we were gone and had fun, but the second we got back and checked her temperature, we knew that it had never left. She ended up crawling in her bed around 7pm and when we checked on her a few minutes later, she was already asleep. Needless to say, we know she was worn out because even the racket of getting Lindsey and Ingram to bed didn't wake her up at all. Well, Don't You Eat Popcorn In Bed Too While You Watch A Movie?? It Takes All Four Of Them To Load The Gun For Some Reason! Ingram Is The Best 4-Wheeler Driver Around! Beau Never Tried To Jump Off While He Was Driving! Now This Driver Is A Crazy Driver!! Thankfully, She Has Ingram Right There To Keep Her Under Control! Our Family On "Our Spot" In The World! The Kids In One Of Aunt Amye's Forts! This Is What Happens When You Are The Youngest! Then Again This Is What Happens When You're The Oldest! You Sneak In To Rescue The Youngest Without The Guard Realizing! Before They're Been Seen By The Other Guard! Now The Chase Is On!! Friday January 27th, Dinner and Driving! Well, we're still super excited about Ingram's scans to say the least! 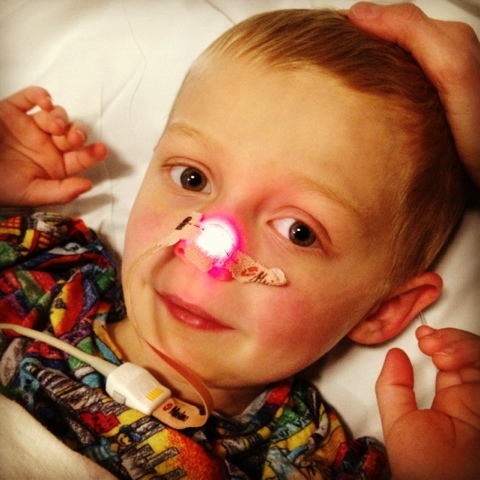 Going through the days leading up to scans are very emotional and exhausting and we try to keep ourselves busy and distracted leading up to them. Then we've got to add Madison's fever that she's had since Sunday night/Monday morning that's really getting on our nerves. She's been out of school all week long and we've been doing our best to keep the kids separated as well. On top of being sick all week, missing her friends, Madison was really upset tonight because our family was invited to an ALSAC event and because of her fever, she was unable to go. 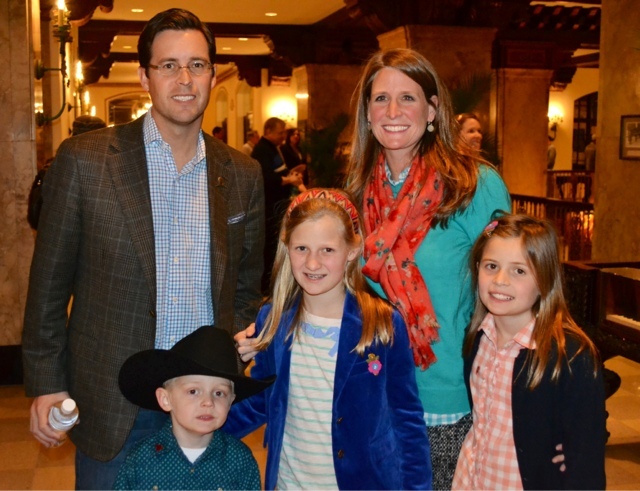 Craig took Lindsey and Ingram to the Tri Delta Dinner and St. Jude Patient Panel while we stayed at home. We love the Tri Delta Sorority for all the fundraising they have done for St. Jude, but they take things to a whole new level when it comes to raising money! They have raised $20 million for St. Jude over the past 10 years and that's 25% of all the money raised by 100+ fraternities and sororities for any charity. Of course our girls love the Tri Deltas even more because of how much fun they had with them at James Madison University and University of Virginia this past October on their business trip with Craig. Ingram and Lindsey had such a fun time at the dinner and got to talk to a few other patients but a whole lot of the Tri Delta girls too. They had sooo much fun that it was 10pm before they were even back to the car to head home. During the patient panel, Ingram and Lindsey answered some of the questions on stage of Ingram shouted out "Get Your Move On!" again. Anytime he has access to a microphone, he says it and everyone seems to laugh too! They were so excited to get to see Liz, whose sister battled cancer, and Lauren from JMU and Elly and Anne Marie from Virginia; we also just found out that the Tri Delta chapter at James Madison University was named as the "Sorority of the Year" at their school which is pretty exciting! While they were gone, I finally convinced Madison to leave the house and we rode around in the car for about an hour so that Madison could get out of "Jail" as she calls our house; the poor girls hasn't been out since Sunday afternoon. We drove by two of our old houses in our area and just had a fun time goofing off in the car together. Neither one of us thought riding around in the car could be so much fun! 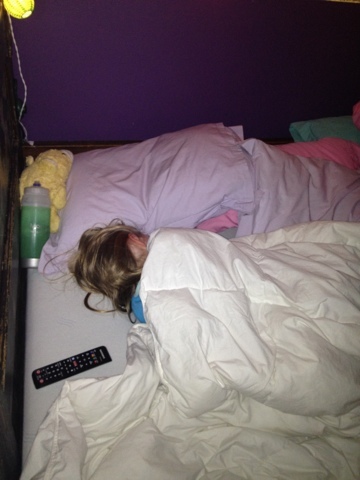 Once we got back home, we finished a movie and then she was asleep before Craig and the other two even got home. 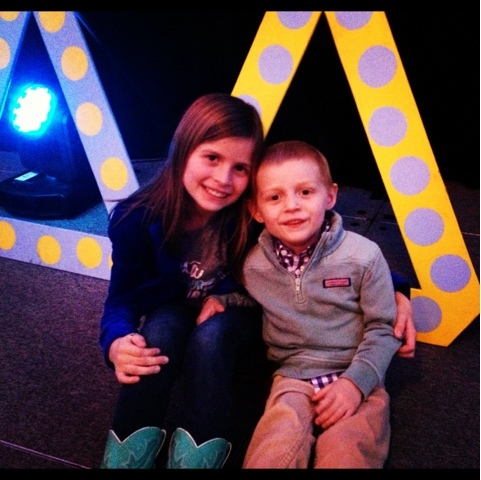 Lindsey And Ingram At The Tri Delta Dinner! Lindsey's Even Wearing Her Tri Delta T-Shirt That The Sweet Gals At JMU Gave Her! I'm Out Of The House! I'm Out Of The House! Thursday January 24th, Scans Are Clear! Ashley wants me to write about our day today, and I’m not nearly as thorough. We obviously focus on different aspects of everything! But that’s probably good for many reasons. 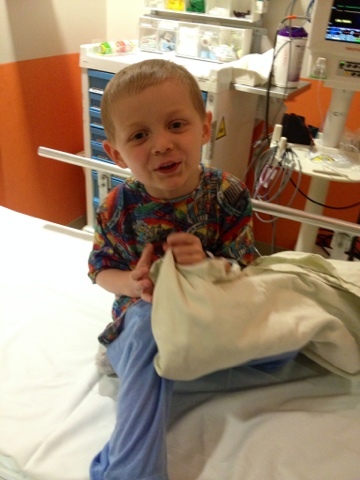 We had Ingram’s second set of post-treatment scans today. 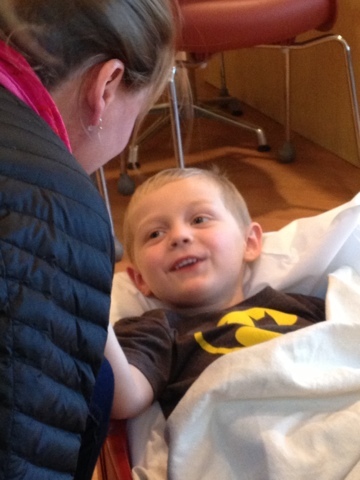 We’ve been done with treatments since late October. It’s been a little harder emotionally since we haven’t been receiving treatments because we aren’t actively doing anything. The stasis makes us feel like the tumor could come back. Nonetheless, this is just the beginning of a long road. The scans today were clear! In other words, no signs of a tumor in either the brain or the spinal fluid. It was a huge relief for us, and for our family and a whole lot of friends who seem to be in the middle of this valley with us. Ingram was a stud once again. He didn’t cry at all when he was accessed...twice. 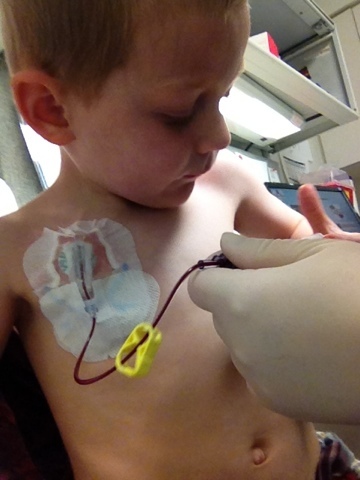 He helped the doctors with the IVs, as he always does. And he was a magnet for attention, as he also always is! I was stopped by a stranger a few weeks ago – that’s not unusual nowadays. They asked me if I was “Ingram’sdad.” I laughed to myself about my new identity. It felt like something from a movie. The reality of it is, yes, I am. And I am quite proud to be “Ingram’s dad.” As I said, he’s as stud! Thank you all for your prayers and your words of encouragement. Our family has been blessed to have so many people in this battle with us. Everyone has their own way of helping and it is a lot of fun for us to watch. When we had the opportunity to speak at the Country Cares event last weekend, Mr.Shadyac asked how our experience has changed our lives. As part of the answer, I told the audience that I had become much more of an optimist about people. That I knew people were inherently flawed,but that there was also an inherent goodness that we fail to see most of the time. Perhaps we don’t see it because we’re too busy to notice. I suspect I’m too busy pursuing my own self-interests to let my own goodness out. That’s one of the few silver linings to life’s tragedies, they remind us that self-interests are less important than loving others. They have a way of putting things in perspective for both the afflicted and those around them. Thank you all for loving my family the way you have. Assessment/Triage To Start Our Long Day! We Love To Play With The Camera! He's Over 35 Pounds Now! AND He Showed Our Nurse How To Draw His Labs! By Making His Name IMGRAM Instead Of INGRAM! Aren't My New Pajamas Cool? They're Rainbow And Oh So Soft! 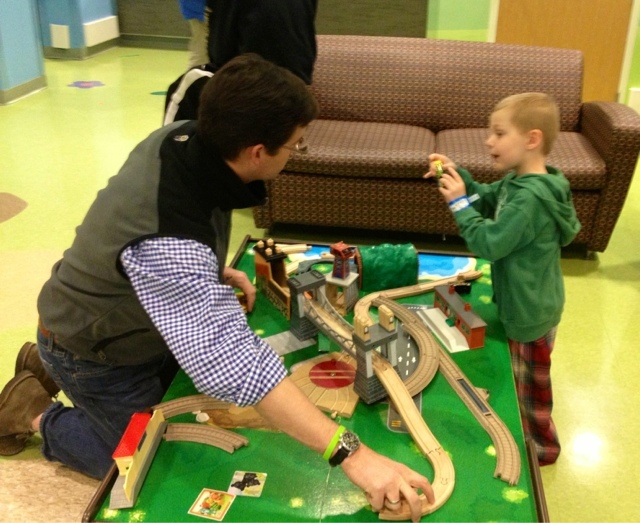 Ingram And Daddy Playing Trains Waiting On Our Appointment With Dr. Gajjar! Ingram The Red Nosed Conqueror! Ox On His Finger So We Started Playing With It! We Were Having A Long Talk With Him At 2pm In The Afternoon! And Finally He Decided On A Grilled Cheese To Match His Cutest Ever Smile! Oh How We Love Dr. Gajjar!! "St. Jude Rocks!" As All Three Of Our Kids Say! Wednesday January 23rd, Ready or Not...Here They Come! So surprising news...Madison still has fever :( We've had fever before when both of the girls were little while we were selling one of our houses and it was no fun because we were showing the house all the time it seemed. Having fever this time is really bad because it's high enough to be a fever, not not high enough to where Madison feels too terrible. The worst part is that she feels good enough and wants to do stuff, but she just can't! The TV is really only interesting for a while you know. Luckily, her fever broke a little today and she and Ingram played Wii Ski together in the back and it was so much fun watching them. We weren't right next to each other, but they were in the same room for quite a while and we're praying that he doesn't get anything. Lindsey was the first one out of bed this morning because I had to wake her up for school! Apparently all the playing we did with Mr. David here wore her out and she needed some extra sleep. She was a happy camper and enjoyed being the only up and getting my undivided attention; we even left Beau in his kennel until she was waiting on her ride. She came home for a quick snack before she was off to Gabby's house for some sweet Math homework relating to fractions. And I do mean sweet literally; they made fractions out of S'mores and enjoyed eating them too! Once back home Ingram and Lindsey played and also ended up sleeping together again tonight; they're just the cutest things when they find out we're going to let them sleep in the same room. So we go in for scans tomorrow. It will be a full day but we won't know the results until ate in the day it appears. Scans are a funny thing - for lack of a better description. I think I cognitively reduce them to an up or down for Ingram's life. That isn't to say that if the tumor returns we can't fight it. Certainly, we would. 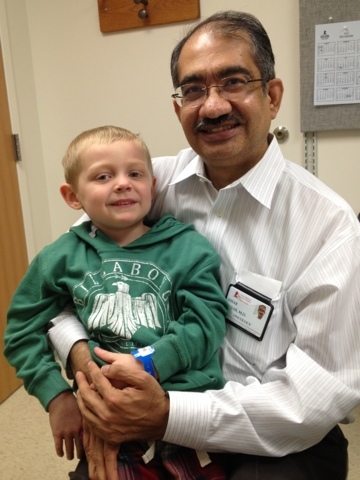 But with ependymoma, the odds are not nearly as good if it does return. And even though God tells us not to worry about our lives, that we can't add a single hour by worrying (Matthew 6), that's very difficult to do. Because of my fallen nature, I don't rely on God as instructed. Instead, I try to orchestrate my life to fit neatly into the little box I envision it being. I go to great lengths to make sure nothing can possibly go wrong in just about everything I do - rather that is a family vacation, weekend plans, a work event, etc... Unfortunately, the outworking of my life is a microcosm of how my brain and heart work. I profess to have faith in God's plan for my life (and for Ingram's for that matter) but then I do everything I can to make sure God gets it just right. 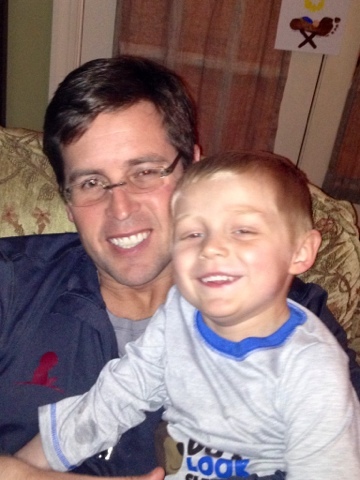 If I could buy a cure for my son, I would just to make sure God didn't have a different plan in mind. I know I'm crossing some curvy gray lines between sovereignty and sensible-self-determination. But at the end of the day, I do whatever I can to minimize the amount of faith upon which I have to rely. I used to do that with my belief in God. I studied apologetics for years and read as much on molecular biology/biochemistry as I could stand so I could prove logically and scientifically why I believed in something that could not be proven. If I could at least disprove someone else's worldview, mine wouldn't seem so naive. At the same time, I was praying that God would give me great faith like I saw in some of my friends, that I wouldn't question everything all of the time. It's funny how God sometimes gives you what you ask for but in ways you don't expect, and sometimes in ways that are a little more painful that you would have chosen. But as James 1 says, we should thank God for our trials because they 1) test our faith, 2) produce perseverance, and 3) eventually make us complete. It does not say that God is giving us trials, but He obviously allows us to go through trials. There is an important distinction between the two for our family. 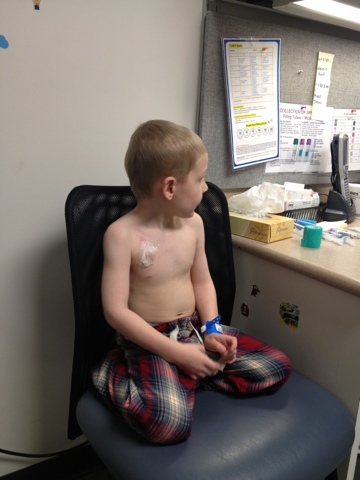 God didn't give Ingram cancer; but, He allows Ingram to have it. Meanwhile, He is here every step of the way with us - often showing His love through many of you who read this. 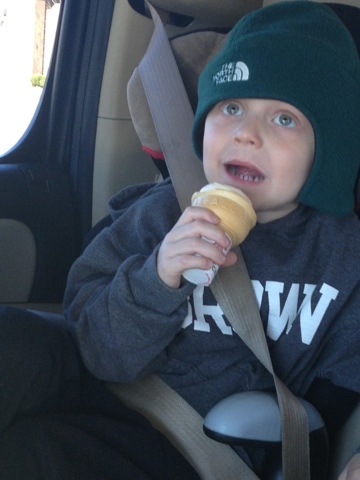 All of that rambling to say, Ingram's scans are tomorrow and we have been anxious about them. We don't say it out loud, even to each other, but we are scared. I have 100% faith that God hears our prayers and He will never leave our side. I have 100% faith that He loves Ingram in a more perfect way than Ashley or I do. And I have 0% confidence that I know what God's plans are. But I plead with Him that it will be to keep the cancer away from my son. And that's the newest lessen of faith I guess I'm learning - having 100% faith that with His help we can handle whatever His plans include. But I still wish there were a way I could help Him get Ingram's plans right. She's Like A "Pink" Ray Of Sunshine! 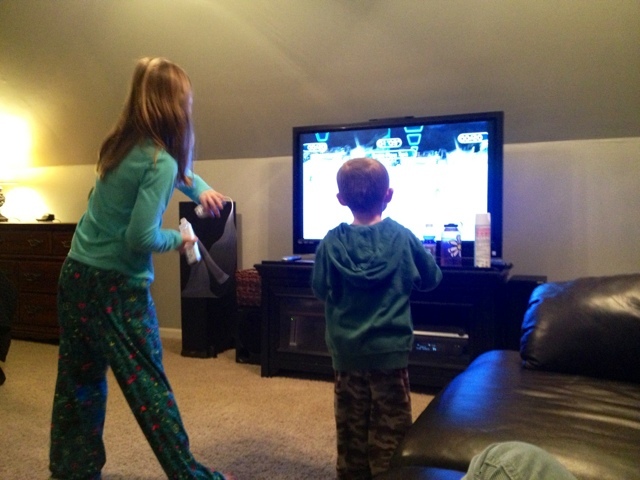 But They Had So Much Fun Playing Wii Ski Together! 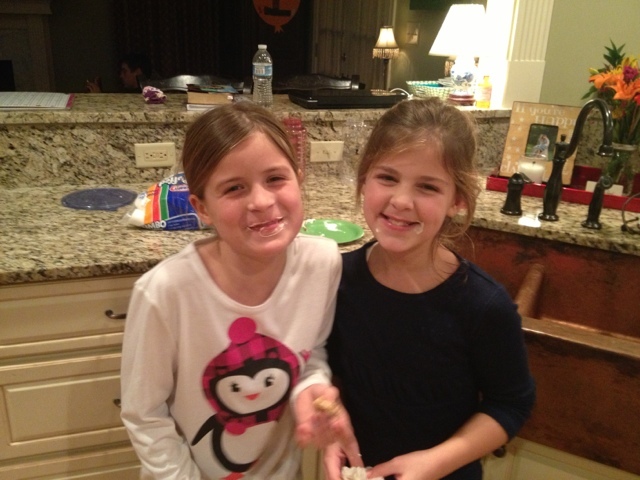 Lindsey And Gabby Working Out Their Fractions With S'mores! Anyone Want To Go Back To Third Grade With Me To Play With Their Food?? I Just Love My Guys! Tuesday January 22nd, School Or No School...That Is The Question! Well at least two of the kids got to go to school today! Madison is still running fever and is quarantined to the house...against her will she would add. She is going on the second whole day in her room and is starting to go a little nutty from being by herself. She is quite the socialite and loves to be around people but she has almost finished a whole season of one of her shows which was keeping her occupied during the day when when all her friends were at school. 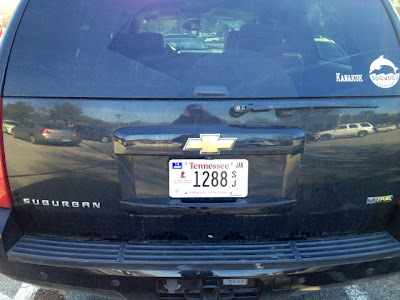 I made a quick run to the County Clerk's office to renew my car tags but decided instead to go ahead and switch out our regular plates for St. Jude plates. Unfortunately I was only able to switch out my plate today, but hopefully next month we can switch out Craig's plate next month when it's time for his renewal. Ingram and Lindsey went to school and had great days. I love picking up Ingram at the end of the day because he greets me with the biggest hug and kiss and smiles non-stop while he tells me everything he did at school that day. 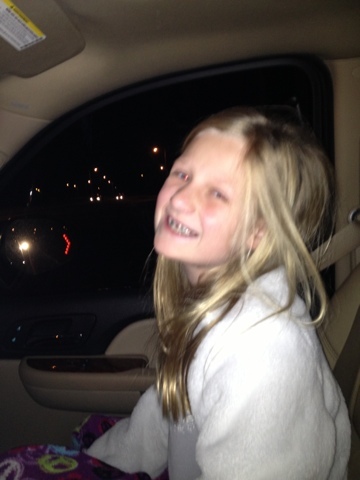 Lindsey came home with the same smile, especially when she realized Mr. David was at the house. He was in town for school and stayed with us for the night and he even played "Are You Smarter Than A Third Grader" with Lindsey and her spelling words. Lindsey also read her reading story to Mr. David and Daddy and made up questions for them to answer; what would we do without Mrs. Berry for great learning ideas! Ingram, Lindsey, and Mr. David played Wii Car for a while until Mr. David got kicked out by Lindsey! She asked to see his remote so that she could show him something, but she wouldn't give the remote back meaning his game was over. That girl can be sneaky!! Just like clockwork, we got ready to do Insanity and Mr. David did it with us too; let's just say he felt much like we did the first time we tried it and it was pretty funny! Lindsey and Ingram were running around in the den "working out" too providing some comic relief which much needed at times. 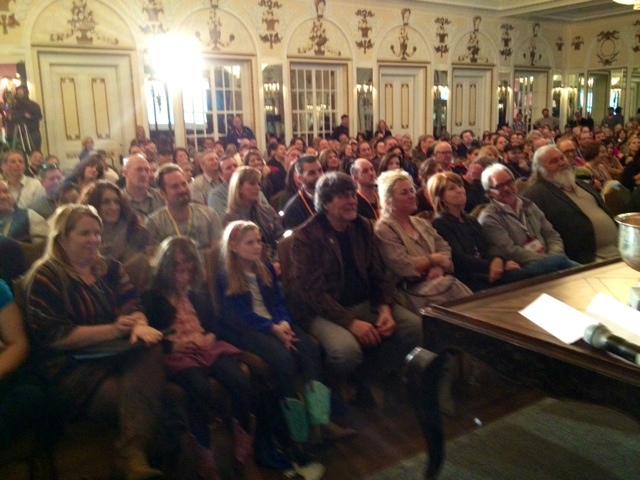 Pops showed up too and we had a full house and it was tons of fun! I had even cooked a roast, baked potatoes for a potato bar, green beans with butter and brown sugar, and salad. The only thing missing was some dessert! Oh well, maybe next time the kids will help make chocolate chip cookies. So far, it seems that we're being distracted by several things as we are approaching Ingram's scans on Thursday. We start at 8am Thursday and are set to finish at 4pm; it makes for a long day but everything is done in one day and then when the scans come back clean, that's it for another three months. We've gotten several messages, email, cards, and phone calls encouraging us as we get closer to our appointments which is really great! "SCANxiety" normally starts to make us go crazy leading up to scans, but we have felt more normal and calm with this round of testing. Cancer changes emotions on almost a daily basis and the more relationships we have with other cancer families, the harder it can be because we "ride it out" with them too. Please continue to pray for our family and all the other patients and their families as they continue battling this ugly monster, because some days are harder than others and knowing that people are praying specifically for you and your family, makes it easier to get through the day. 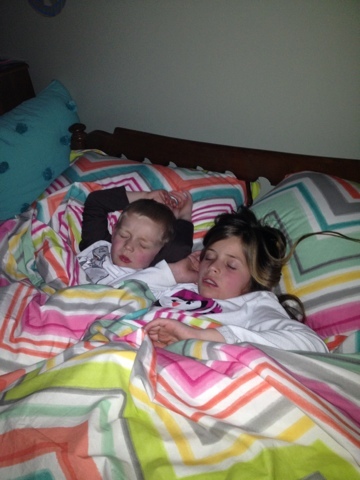 Nighty Night For These Two! It Seems Three Is A Crowd When It Comes To Fever! She's Loving Her Nice Big Bed All To Herself! Doesn't A Nice New License Plate Need A Nice Clean Car?? The Best Part Of Ingram Going To School Is Pick Up Time! I Love My Hugs And Kisses! Sunday and Monday January 20th and 21st, Holiday Fever...Really?? 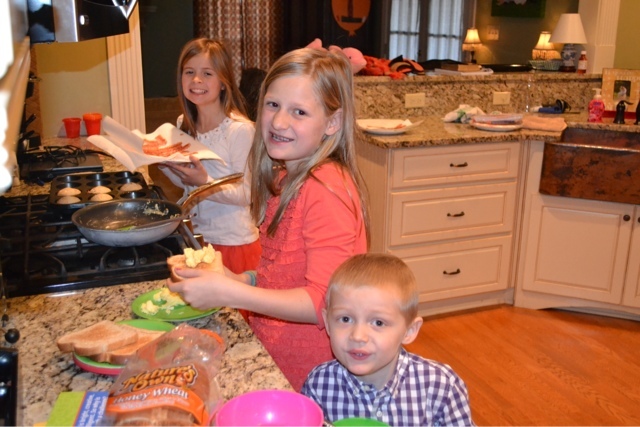 Sunday morning, the kids started making breakfast for everyone before we headed to church. It was great; they made eggs and bacon and toast for everyone! During church, Ingram's eyes were starting to look a little sad and he just didn't have his regular energy level; we were thinking that with everything going around that he might be starting to get sick so we left and took him home to have a nice long nap! We ended up hanging out at home while Ingram napped and then watched a movie. Of course, who wouldn't interrupt watching TV with a surprise trip to TCBY?? The kids were super excited and even went in their pajamas; I don't think anyone was shocked by that since we always get ice cream in our pajamas! I took Lindsey and Ingram down to the farm on the Martin Luther King, Jr. holiday. It was nice because we really haven't had any time off since last April. Even after treatment ended, we still had the race to get through. Then we had the trip to NY, then Christmas and a houseful of family staying with us Christmas Eve night. Then there was the Make-A-Wish trip. And then I had a business trip two days after we returned from Disney. While we have had a few days here and there to take it easy, there has always been something hanging over our heads that was coming up which has kept us from being able to relax. So it was nice to have a day off and be able to spend some time with the kids doing more-or-less nothing. And that's just what we did. The farm, as we call it, is 300 acres (or so) of land out in the country that Ashley's parents own. It's one of those places that when you are there, if you have any ambition to get something productive done, you'll be disappointed. We rode four-wheelers, shot guns, made a fire to cook smores, made popcorn, surveyed the entire land, and climbed up all of the hunting stands (or "Aunt Amye's forts" as Lindsey and Ingram call them). 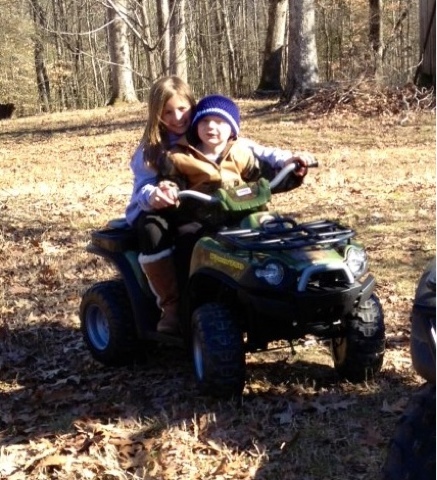 They both love driving the four-wheelers, the big one and the little one (toy four-wheeler Ingram got for Christmas). Unfortunately, Ingram does not know what "just give it a little gas" means. And even worse, I had my camera in my hand while he was hammering the gas and I couldn’t reach up to pull his hand off of it. That made for a harrowing ride for Lindsey and me. Lindsey is a much more conservative driver than her brother - which I was fine with! 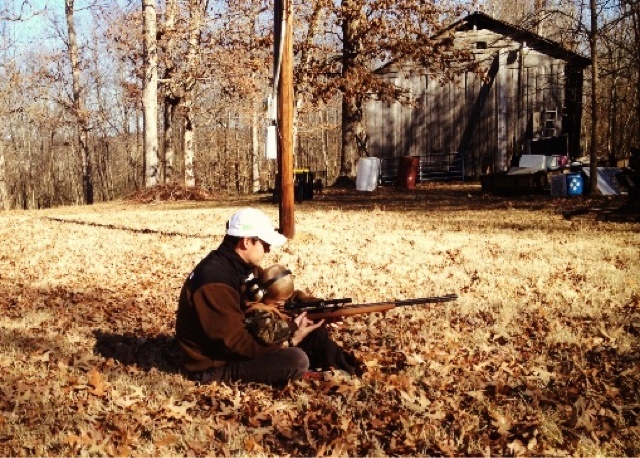 And the deer better beware, Ingram loves shooting the .22. We only had about 30 rounds and he blew through those in 30 seconds tops (Pops, I owe you some ammo). 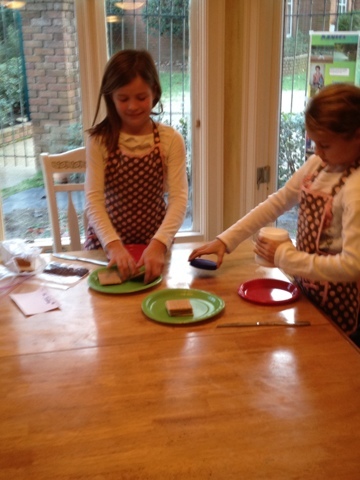 Sweet Kids Making Breakfast For The Family! She May Have Fever, But That's Not Stopping Her From Hanging Out With Her Friends! 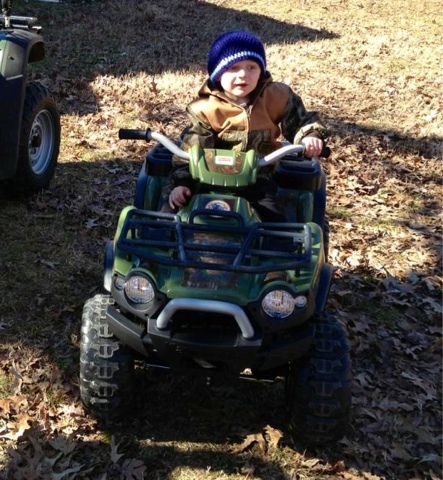 Ingram Is Totally In Charge Of Driving His Own 4-Wheeler! Well I Guess He Thinks He Is!! Knew That Would Happen...Too Much Back Seat Driving From Lindsey! "Shooting The Gun, The Big Loud One!" Friday and Saturday January 18th and 19th, Country Cares! Since we were up so late on a school night, it was a little rough getting up Friday morning for school. Lucky for us, Ingram didn't have to go to school and instead wanted to snuggle and watch cartoons all day which was 100% okay with me. The girls had a great day at school and Ingram had a great nap which is a bonus on any day! Lindsey had an art class Friday night and although Madison asked to go, we let Lindsey be the only Dismuke there; she loved it and came home with a flower painting that matches her room. 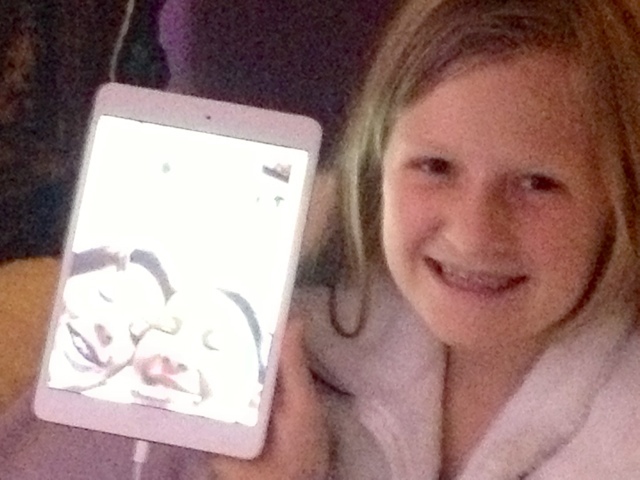 She also came home to her sweet friend Abby spending the night and they had the best time! They even snuck downstairs while Madison and Ingram were upstairs playing and made S'mores in the fireplace in the den and Madison and Ingram never knew. Madison's Saturday morning started early with Goalie practice and then regular team practice. She and Craig were gone for a few hours and brought Emily home with them after getting donuts. 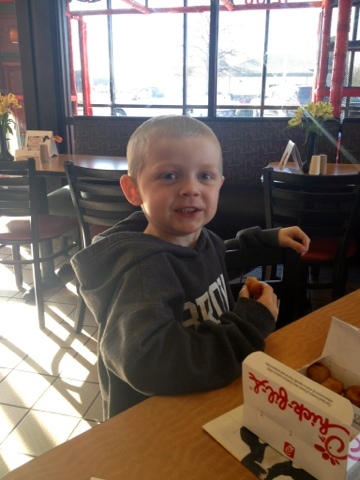 And yes, they brought home some donut holes for Ingram too! A couple hours later, Craig, Madison, and Emily were headed to the indoor soccer game while the three of us headed to the Peabody for a super fun St. Jude event. The crazy thing with soccer all morning and the event during an indoor game was that Madison had to shower before her game at 2pm because she had to be at the Peabody by 3:30pm. She played goalie for the first half then left with Craig to meet us and looked like she hadn't played soccer at all! Randy Owen, from the group Alabama, started Country Cares 24 years ago and has raised $440 million throughout the country music community. 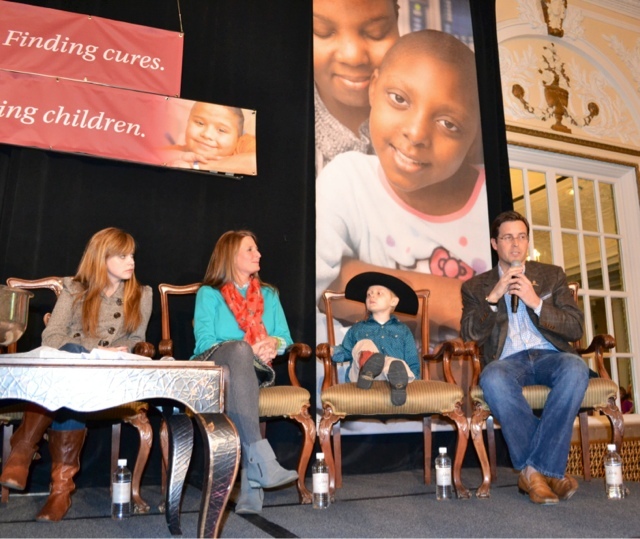 Ingram was asked to join 3 other patients on stage at the kick off conference for the Radio-a-thon and broadcasters from all around the country were in one place. 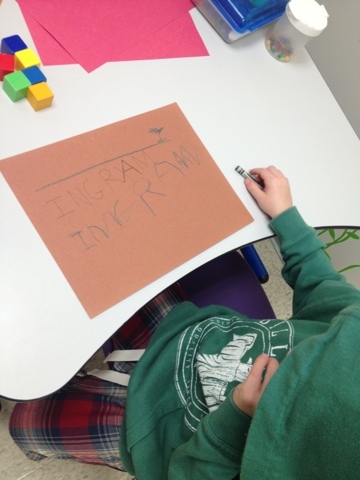 We were asked to tell a little about Ingram and about our experience at St. Jude. Since we never know what Ingram will say, Craig and I were on the stage with him and we all took turns talking to a packed room and an overflow room on a video feed. I'm not a good judge of numbers of people, but I'm pretty sure I've never spoken to that many people in my life! The only problem with an hour long time limit for the whole panel, is that all of us could go on for several hours about how great St. Jude is and how they've changed our lives in the middle of hard times. Mr. Shadyac led the panel and also brought the girls up from their front row seats (right next to Mr. Owen!!) and asked them questions for the audience about their fundraising. Once again, he told them they had a job at ALSAC whenever they're ready; Madison is counting down the days till she can work already! Ingram also was all decked out in his cowboy apparel too and completely fit in with the crowd. He was wearing his super cool authentic Cowboy hat from our good friends Collin and Megan Sewell of Sewell Cars in Texas; what better place to get a real hat right? He was also wearing his cowboy hat and boots that we got in Houston last year on a Thanksgiving trip to G-Daddy and G-Mommy's house. He was a wild man though and couldn't sit still for long; he kept going back and forth between the stage and the front row. I felt bad for Mr. Owen because every time Ingram jumped back up in the girls lap, his feet were not always underneath him. A few minutes later he decided to change his hat to his blue crocheted hat from the Blank family and Mr. Shadyac even made a comment about it. Craig covered for Ingram and said that he was now wearing his "Rock and Roll" hat and everyone laughed. We had a great time and were able to talk to some amazing people from all over the country. We're really looking forward to see how much money they raise this year for St. Jude!! Another exciting thing happened once we were home with the kids...we had a babysitter which rarely happens! Before we were asked to speak at the Country Cares event, we had our sitter set so we could go to the movies together and then to dinner with friends. I should clarify we never ever go to the movies but were really excited about heading out on a date. The funniest part of the whole night was that once the kids left with Rebecca and Katie Caroline (they're sisters and if you know our kids, you'd see how it can be beneficial to have both of them), we actually fell asleep! Crazy right?? Craig was sitting in our big chair and I was on the couch talking to him one minute then the next thing we know it's been 30 minutes and we're about to be late for dinner with our friends. We made it to dinner and had a great time as did the kids on their ventures for the night. Now we're thinking that another time, we should get them back during the day to take the kids out for a few hours and we could take a really long nap...that sure is something we never thought we'd say, but we both agree! I'm Pretty Sure These Two Had More On Their Faces Than In Their Bellies! 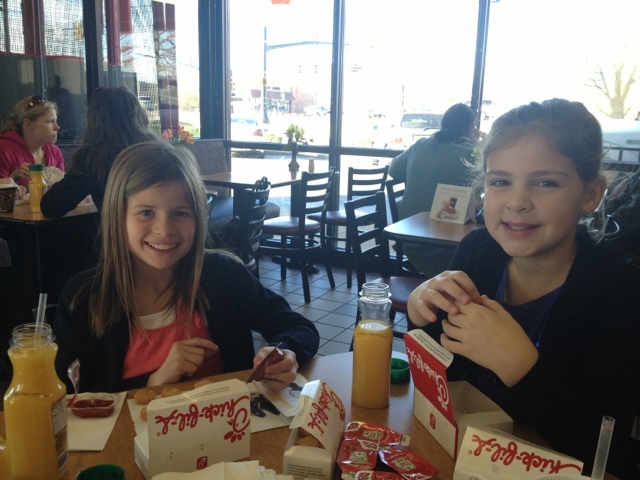 Ingram's Top Choice For Breakfast Made These Two Very Happy!! Had It In HIs Hand Before I Even Knew It! 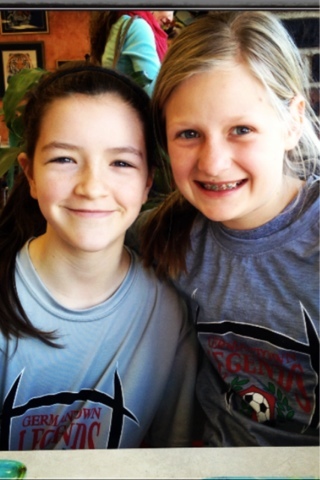 Madison And Emily Refueling After Soccer Practice! All Of Us Before We Went In To The Conference. 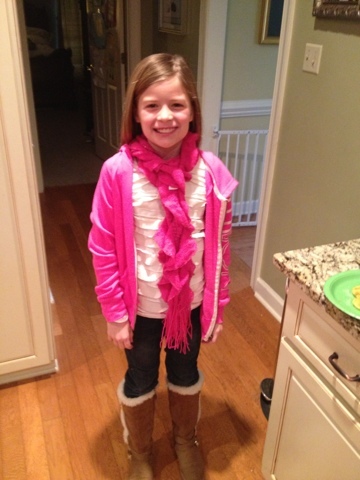 The Girls Also Had On Their Cute Cowgirl Boots From Texas! 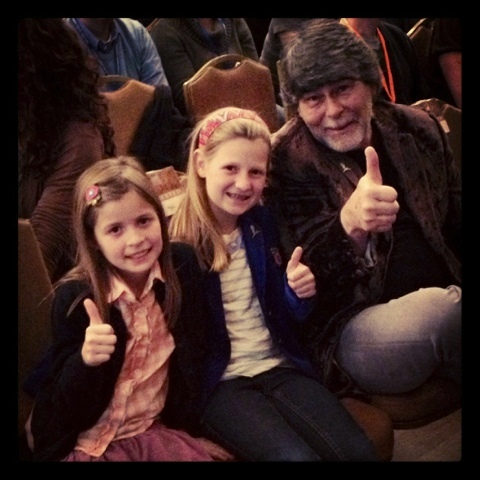 Madison And Lindsey With Randy Owen! So This Picture Doesn't Even Show Half Of The People There!! See What I'm Talking About?? Craig Telling About The Day We Found Out Ingram Had Cancer. (Madison's Age Right Now!!) And Is Now 21 Years Old And Doing Great! 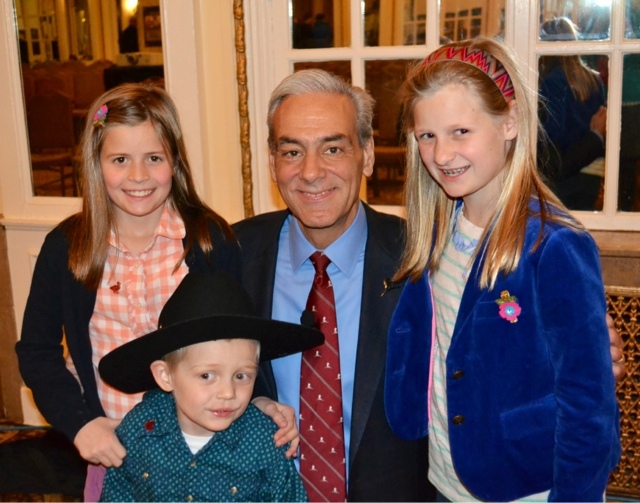 The Kids With Mr. Shadyac! Sunday January 6th, More Magic Kingdom! Friday January 4th, Sea World and iSky! Wednesday January 2nd, Magic Kingdom! Tuesday January 1st, The Adventure Begins!